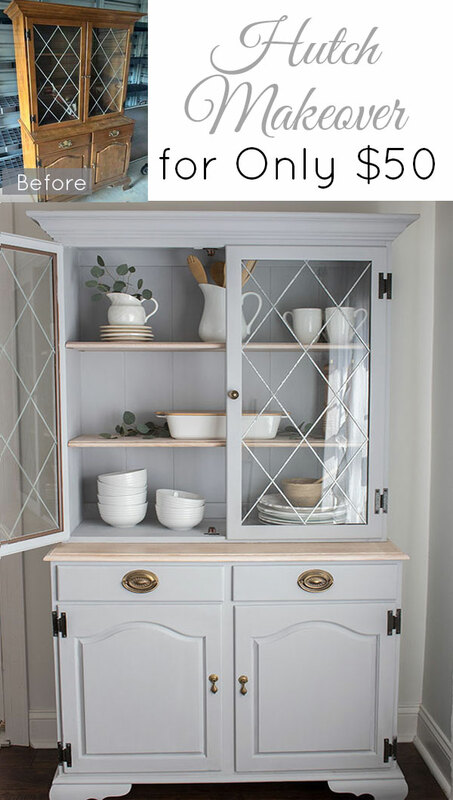 Upcycled Hutch Makeover: This outdated hutch got a new look with chalk paint. The shelves were stripped down to the natural wood for contrast using several different methods. Facebook marketplace is my new go-to for furniture these days. 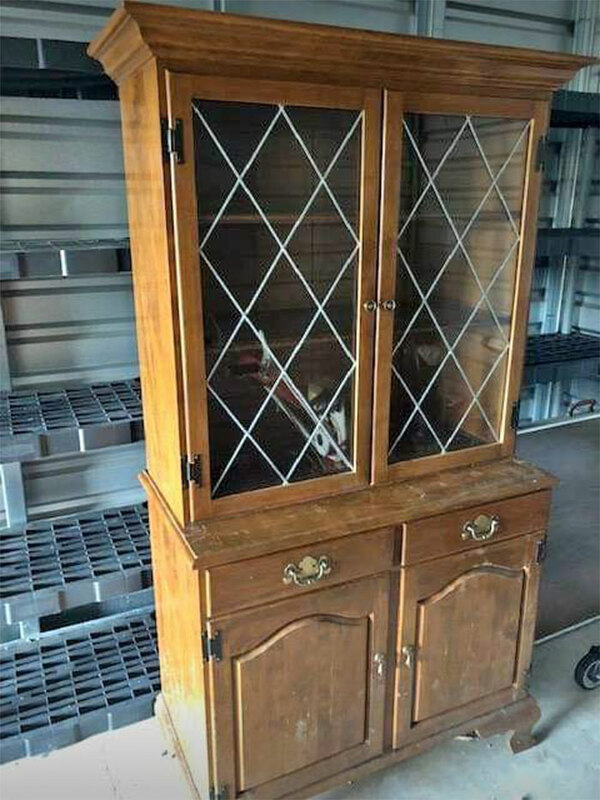 About two months ago I found a hutch on marketplace that caught my attention. I had been looking for one to use in my family room to replace my small sideboard. I figured a hutch would give me a little more storage space by taking advantage of vertical space. The spot where I wanted to put the hutch is a little awkward so the dimensions had to be pretty close to exact and this one was. And it was only $45! Here is a picture of it before I did anything to it. I picked it up from the seller’s storage locker. It was in pretty bad condition when I got it. I was surprised when we got it home and began cleaning it that one of the drawers inside were stamped “Ethan Allen”. Not a bad score for $45! 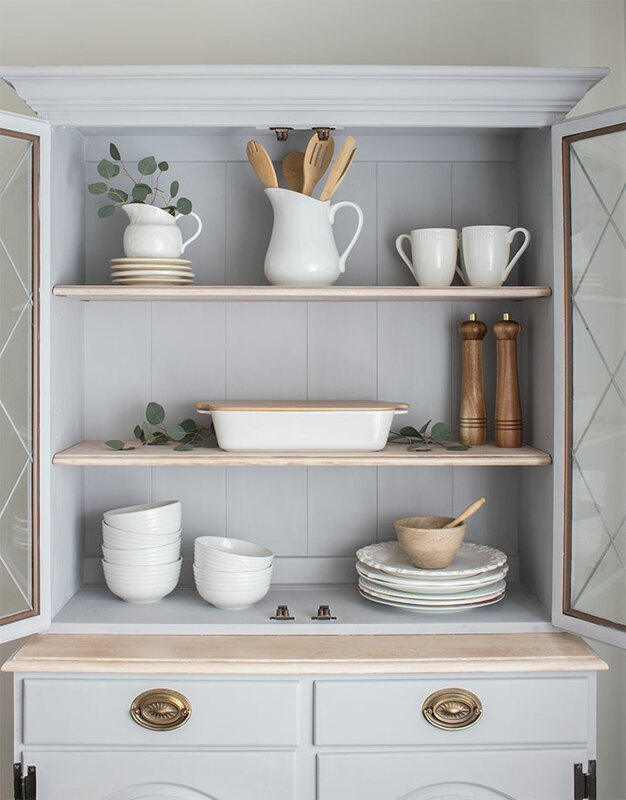 This hutch makeover took me far longer than I had anticipated but it was definitely worth the effort. My first thought was to strip the finish off of the entire hutch and make the whole piece unfinished wood. What I ended up doing was stripping only the shelves and painting the rest. I had never stripped a piece of furniture before so I tried several different methods to see what would work best. 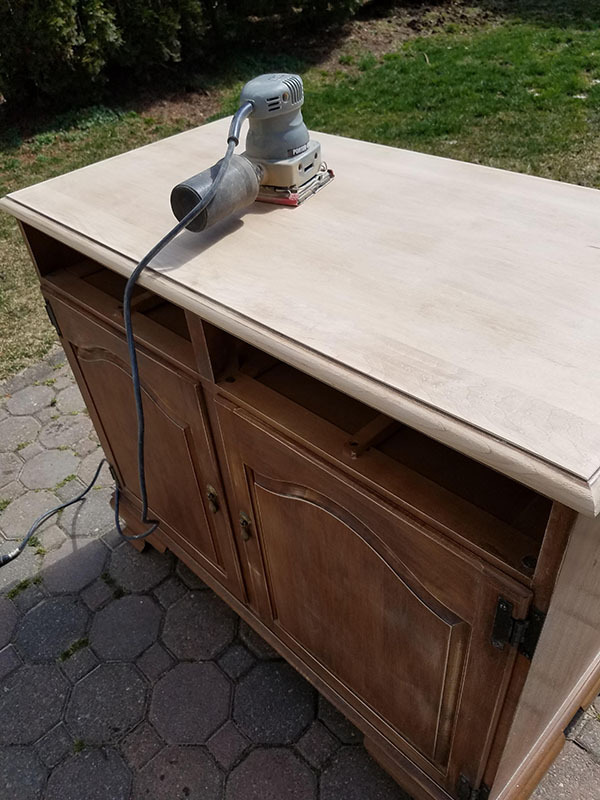 I was hoping to find a quick and easy way to do this, but I found there really isn’t a quick fix for stripping furniture. First I tried something called a soda blaster that I borrowed from a friend. 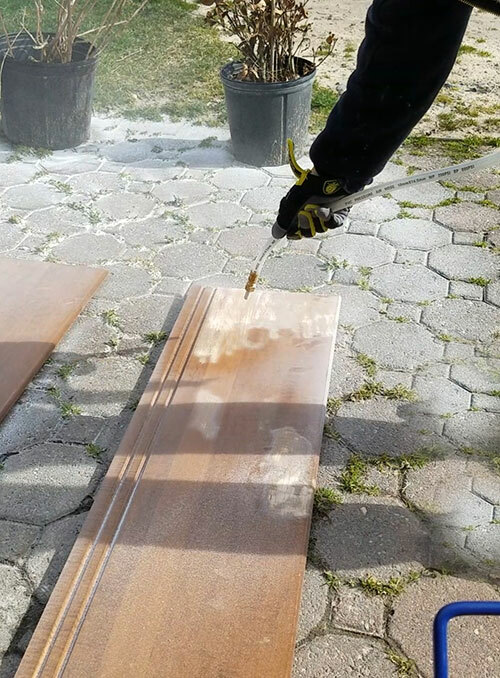 It’s just like a sandblaster but it uses baking soda instead, which won’t damage the piece your using it on. I’ve heard it’s often used on boats and cars. While this method did work, it was a lot of work to set up, it only worked in spurts, and the baking soda needed to be refilled often. It attaches to an air compressor and requires tons of baking soda to get even small areas done. It also leaves a mess of baking soda all over the place. I quickly realized that this method was not preferred so I moved on to a chemical stripper called Zip Strip. This also worked but is a little time consuming and labor intensive. I applied the chemical as per the directions and scraped it off with a spackle knife. I followed up with a palm sander. This did give me the finish I was looking for. I’ll do a more detailed post on this process when I share a dresser makeover I’m working on now. After I sanded the top of this (and the shelves which I didn’t take pics of) I applied a light coat of this cerusing wax to give it a very light, white-washed finish. 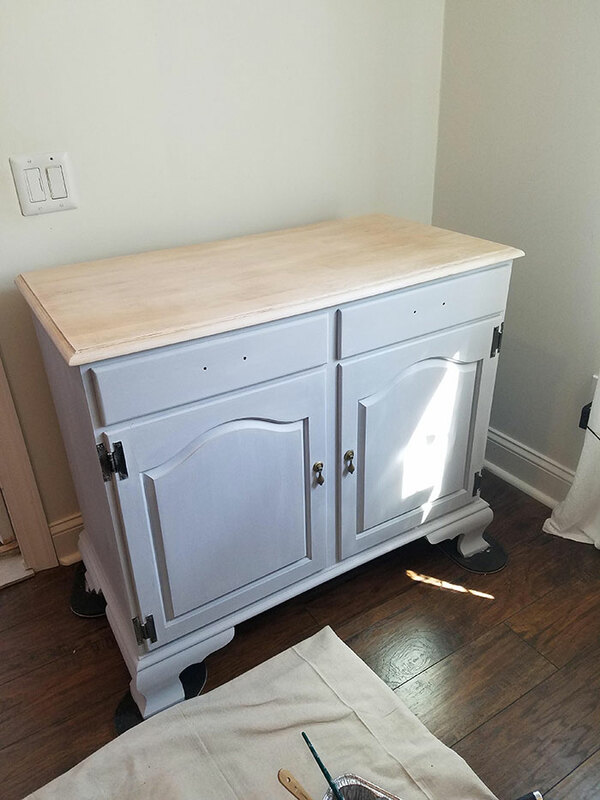 After I finished up with the shelves, I painted the rest of the hutch with chalk paint in Paris Gray to match the table I have in my small dining nook. For more detailed information on how to use chalk paint check out my ladder back chair makeover. When that dried, I added a coat of the clear wax to protect the finish. I didn’t like the existing drawer pulls this hutch came with so I switched those out with these bail pulls. The borings on the bail pulls were in the exact same spot as the existing holes from the old pulls so that was a quick and easy change. 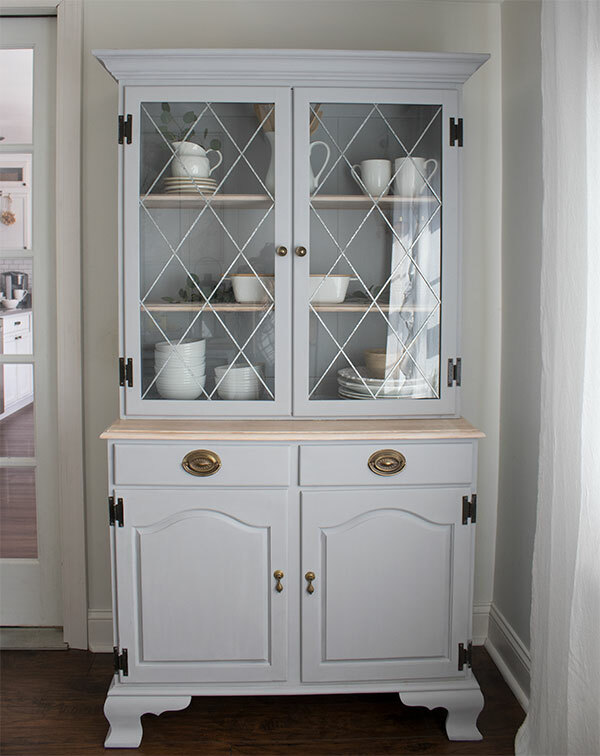 When I found this hutch on marketplace I wasn’t really sure that I loved it, but now that it has a new look I’m happy I went for it. It’s also fun to style with my white dishware. 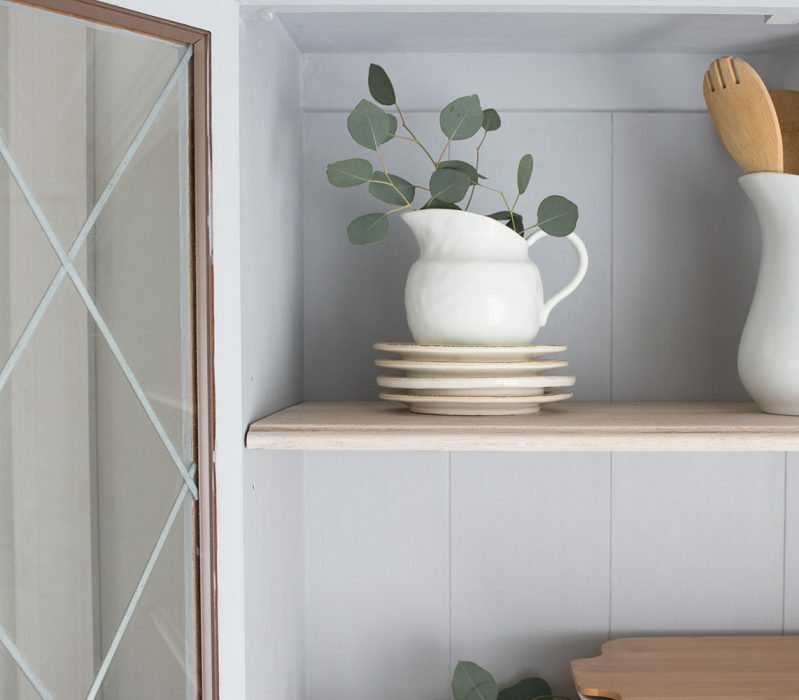 Though this hutch has modest dimensions, it offers a ton of storage space both above and below. Even with the cost of the chalk paint, chemical stripper, and the new drawer pulls, the total cost still came in under $100. I most definitely couldn’t have bought a new hutch for anywhere near that price, especially one from Ethan Allen. There was another thrifted hutch I was looking at that was over $600 but I definitely couldn’t justify spending that much and I’m glad I didn’t! So pretty, you did an excellent job!!! I love seeing old pieces updated with new ideas. It is exciting to see them come back to life in this décor with painting things. I am one that loves to redo old pieces. You did an amazing job with adding all the new hardware, too. I redid a cabinet white and did all white pieces inside. Something about white just makes it so clean looking. Loving the new look! Always a ton of work, but so worth it when you are done and able to enjoy. Nice job! Thank you, Lynn. 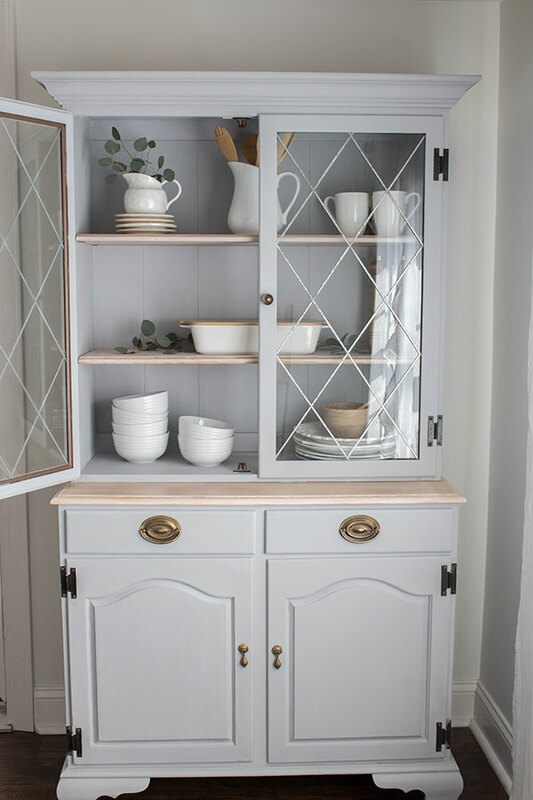 I always love the all-white look and that was my first thought for this hutch but I decided to try something different this time! Love the smaller size (small homes unite! ), and love the light color top with the gray paint. Beautiful pulls, too, Roxanne! Hope you will come and link-up at Homestyle Gathering tomorrow! You got a great deal and it turned out beautiful! Good call changing out the early American drawer pulls, now it looks more Duncan Phyfe style. I love FB Market, so addictive! Thank you, and yes it is addicting! Thank you, Diana! Best of luck with yours! Great makeover. I love paint and stain together on furniture. Colors are so good too. Great find Roxanne. It looks so light and bright now. Well done. 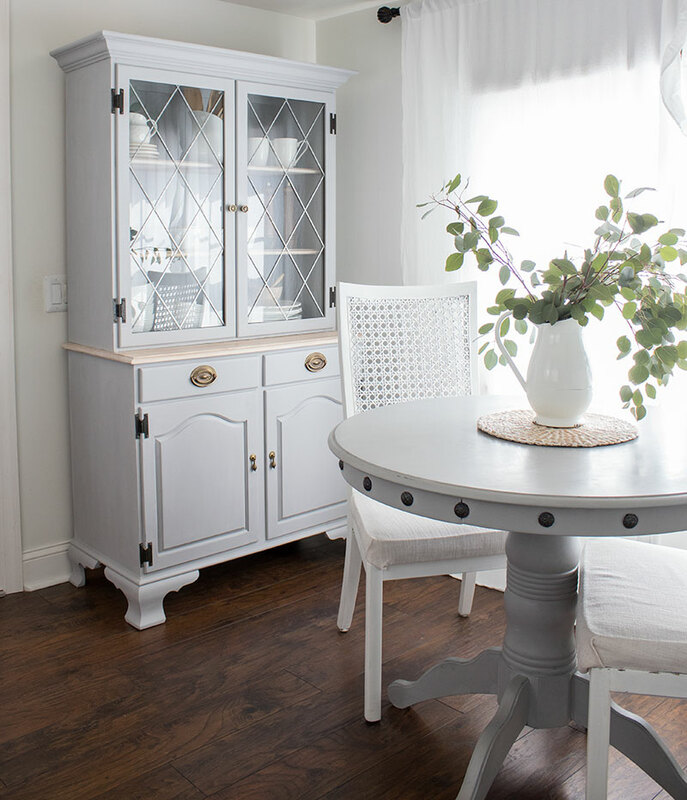 This is such a beautiful furniture makeover. 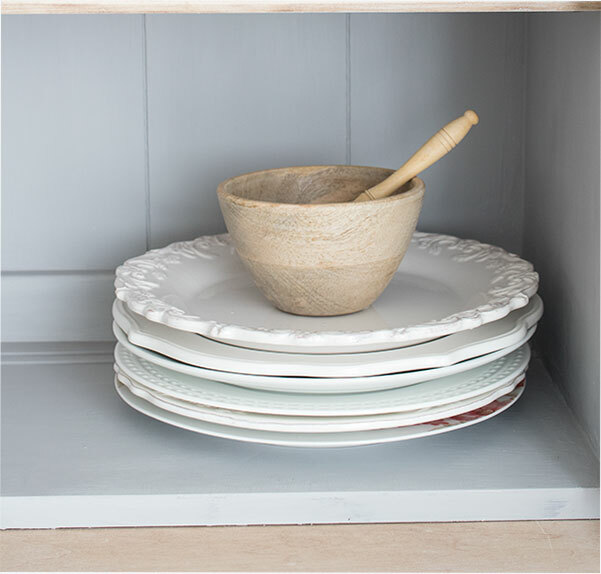 I especially love the soft color of the wood which compliments the painted portions. That turned out gorgeous. Great job.